First I would like to say mahalo to Robert and Jeff for organizing this event. I look forward to this race every year since it takes place on my side of the island. The Sunset2Haleiwa course has been my main training route this year in preparation for M2O. I have paddled it in probably every condition and have a good feel for the water on this side. I guess you could say a little home court advantage played a role in helping me to win ?. Most days on north shore the typical ENE trades will be blocked by the mountains and it can be a flat water grind. Race day provided a little more North in the wind and it was blowing nicely at our backs the entire run. A lot of people question inside line or outside? I chose an outside line knowing the wind had a little more strength and consistency on the outside. I've found that certain areas on an inside route can get sluggish, especially passing Waimea bay. This proved to be true when I started to pull away from Hobie Hammah Keoni - who was on an inside line - right around Ke Iki point. Around that same spot Roberto showed up on his unlimited a little further outside of me - he looked effortless and was just gliding along. I had to start working harder and focus on finding the bumps to keep up on my 14' board. Roberto and I went back and forth with the lead for next three miles till he started to make his move in to Puena point. Still about a mile away from the point I still held an outside line knowing that as you near Puena, the swell and wind kinda wraps from the outside right into the point. Working hard for the win, I eventually passed Roberto, hugged close to puena point and then stroked it home to the finish line. I was stoked to win, the Conditions were great, bumps the whole way, but most importantly another fun event with a great group of paddlers. Thanks Blue Planet / Wet Feet for making it happen! 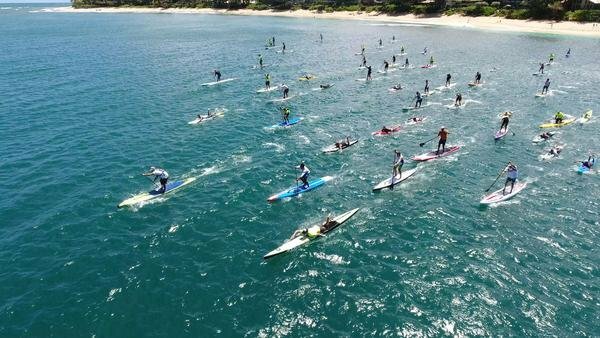 We had a great turnout of over 60 prone and stand up paddlers and conditions were beautiful, thank you everyone for showing up! Congrats to prone stock winners Kai Hall and Leane Darling, prone unlimited winner Anders Jonsson, stock SUP winners Noah Ho'omaikelani Garfieldand Jenn J Lee, and SUP unlimited winner Roberto Lopes. The series winners who won the cash were prone stock men 1) Pat Wong, 2) Johan Loo and 3) Mike Abbott and women 1) Colleen Tessler. For stock SUP Men it was 1) Kione Dahlin, 2) Tyler Jaggers and 3) Scott Ito and women 1) Jenn J Lee.